WAPOTEC GmbH is an internationally recognized company that has developed global recognition with its high-quality and qualified consultancy in process optimization. WAPOTEC filters are an achievement in filter design and construction. These deep bed, multi-layer filters are made in Germany to meet the strict Europen DIN performance standard and have a longer service life than conventional north american filters. 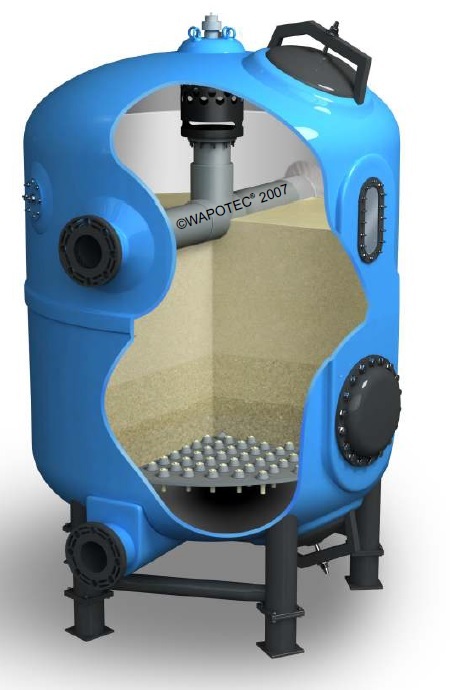 The WAPOTEC filter does not have any laterals that can break and cause pool downtime, instead the filter floor is fitted with small nozzles that can be plugged if needed from the filter underside. Other innovations include a patented HYFLOW diffuser that ensures an even filter bed, and a filter view window with light so that the backwash can be monitored and flow adjusted to prevent excessive backwash flow rates resulting in filter bed disturbance and media loss.